This artist's impression shows how the Arches star cluster appears from deep inside the hub of our Milky Way Galaxy. Although hidden from our direct view, the massive cluster lies 25,000 light-years away and is the densest known gathering of young stars in our galaxy. The illustration is based on infrared observations with Hubble and with ground-based telescopes, which pierced our galaxy's dusty core and snapped images of the luminous cluster of about 2,000 stars. Some of the brightest blue stars in this illustration are among the most massive stars astronomers found with the Hubble telescope, weighing about 130 times more than our Sun. The cluster is so young, about 2 to 2.5 million years old, that Hubble caught them before they exploded as supernovae. The cluster's massive stars are illuminating a wall of a giant hydrogen cloud [the reddish-purple filamentary structure along the right edge]. Large clouds like this one make hefty clusters like the Arches. The bright reddish object at upper right is the center of our galaxy, residing 100 light-years away from the Arches cluster. 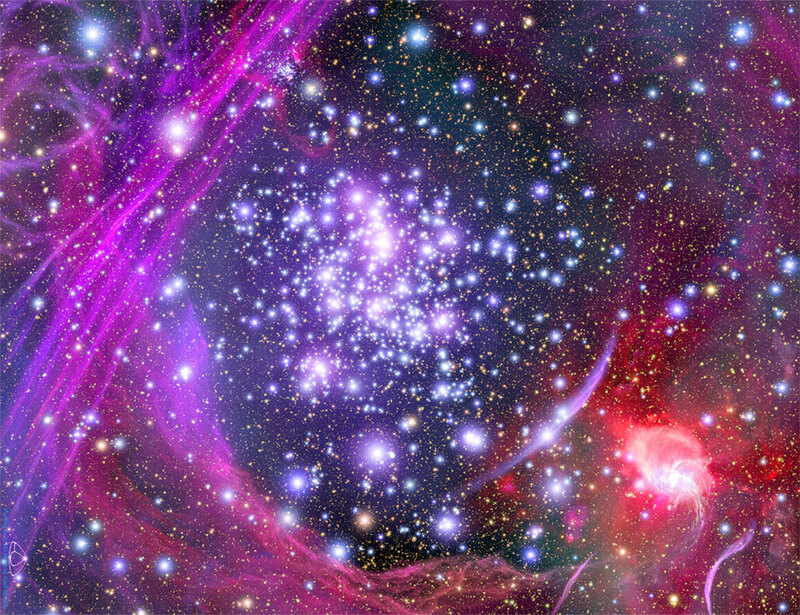 The glowing purple thread-like objects at lower left and the purple arcs at upper right are high-energy particles caught up in strong magnetic fields. Astronomers do not know the origin of these fields.